There are over 125,000 lakes in the contiguous United States and Alaska claims to have over 3 million lakes. Many of these lakes are fairly small and don’t even come close to the size of the lakes on this list, which were chosen based on surface area. All five of the Great Lakes are on this list and they completely dwarf the other five large lakes. In addition to being the largest lakes in the United States, some of these lakes are also the largest in the world. 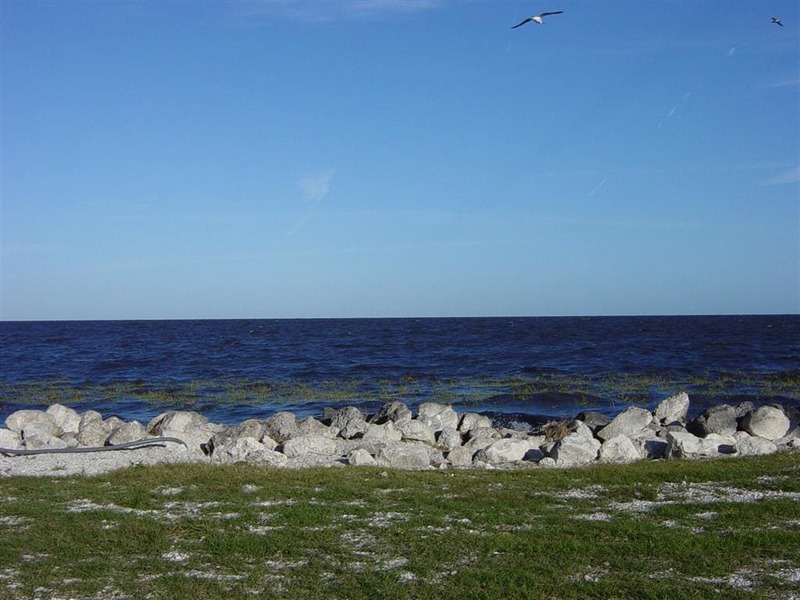 Lake Okeechobee is the largest lake in Florida and the second largest body of freshwater in the contiguous United States. Florida’s large lake has a surface area of 734 square miles (1,900 square kilometers) and is very shallow with an average depth of only 8 ft 10 in (2.7 m). The lake’s name, Okeechobee, comes from the Seminole Indian words for “big” and “water.” In the past, Lake Okeechobee was called Mayaimi by the Spanish and other European settlers also had various names for the lake, including Espiritu Santo Laguna, Lake Mayaca, Lake Macaco, and Lake Sarrope. For the past few years, toxic algae has been blooming in Lake Okeechobee and running into the nearby waters of South Florida. Lake Oahe does not look like a traditional lake and instead looks more like a river. This is because Lake Oahe is a man-made reservoir and is the largest man-made lake in the United States. Lake Oahe has a surface area of 685 square miles (1,774 square kilometers) and a maximum depth of 205 feet (62 meters). Within Lake Oahe is the Oahe Dam, which is one of the largest earth-rolled dams in the world. Lake Oahe gets its name from the Sioux Indian word meaning “a foundation.” Lake Oahe was in the news in 2016 during the Dakota Access Pipeline protests because the pipeline was set to be built under the lake. 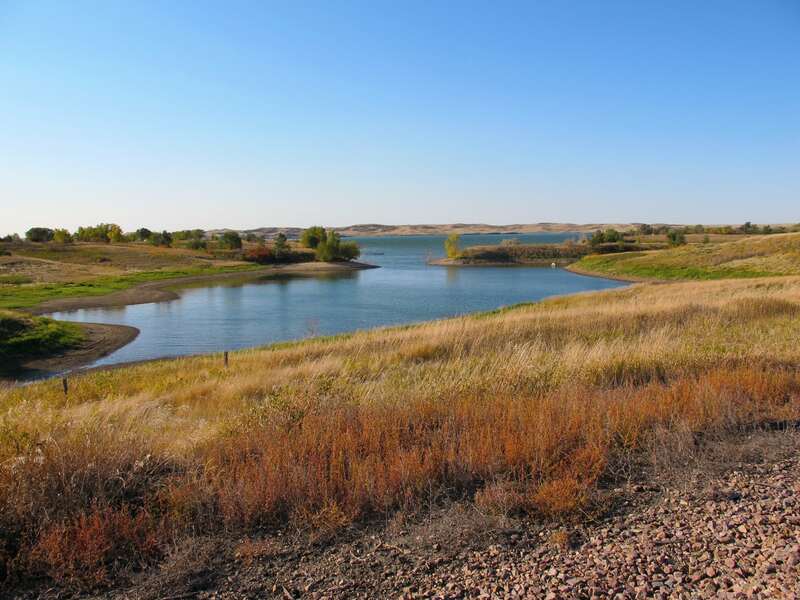 Compared to the other lakes on this list, Lake Oahe is very young and is only 56 years old. Iliamna Lake is the largest lake in Alaska in both surface area and volume. Although Iliamna Lake may be smaller than most of the other lakes on this list with a surface area of only 1,012.5 square miles (2,622 square kilometers), it is very deep. Iliamna Lake has a volume of 27.7 cubic miles (115 cubic kilometers) and an average depth of 144 ft (44 m). Since Iliamna Lake is so deep, there are rumors that a creature called “Iliamna Lake Monster” stalks its waters. Many people believe that the creature, nicknamed the Illie, is a massive cryptid fish that ranges in size from 10 to 30 feet. Iliamna Lake is home to the only population of freshwater seals in the United States. A majority of Lake of the Woods is located in the Canadian province of Ontario, with a very small section in Manitoba and the rest of the lake is in northern Minnesota. Lake of the Woods has a surface area of 1,679 square miles (4,348.6 square kilometers) and a volume of 4.65 cubic miles (19.4 cubic kilometers). The Minnesota portion of the Lake of the Woods is known as the Walleye Capital of World. 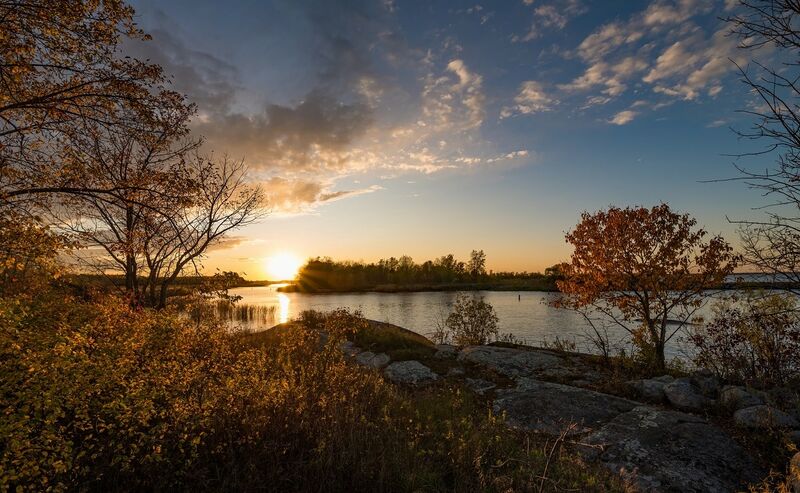 The Lake of the Woods is also home to a number of other fish species, including northern pike, sturgeon, perch, black crappies, bass, muskie, and sauger. The Lake of the Woods has a long shoreline that is over 25,000 miles. If the entire Lake of the Woods was in Canada, it would have the longest coastline of any lake in Canada. Great Salt Lake in Utah is the largest natural lake west of the Mississippi River. It has a surface are of 1,700 square miles (4,400 square kilometers). As its name suggests, the Great Salt Lake is hypersaline, or salty, because it does not have an outlet. Great Salt Lake is also the largest saltwater lake in the Western Hemisphere. The saline levels in Great Salt Lake are too high to support most types of fish and other aquatic life. However, some algae, brine shrimp, and brine flies are able to withstand the saltiness of Great Salt Lake. 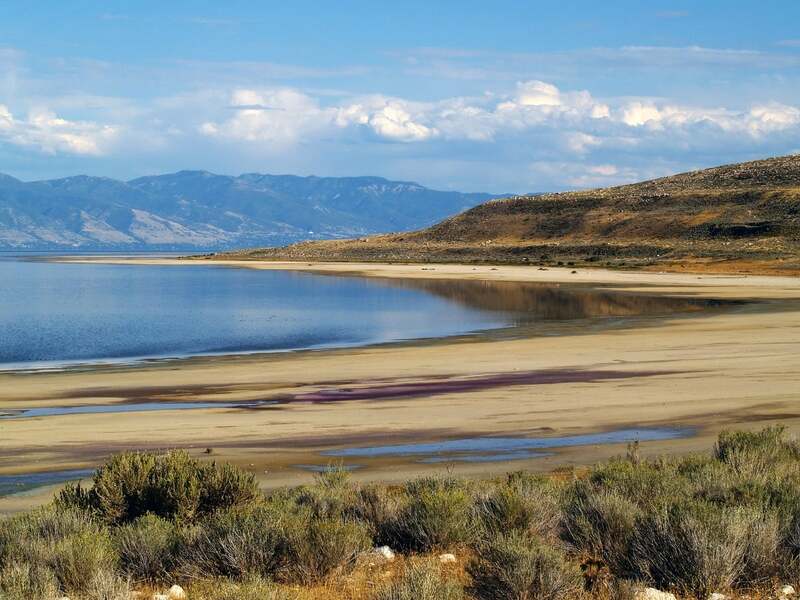 The waters of the Great Salt Lake are two different colors – the northern part of lake has a rosy hue because of the salt-loving microbes that live near the railroad causeway. 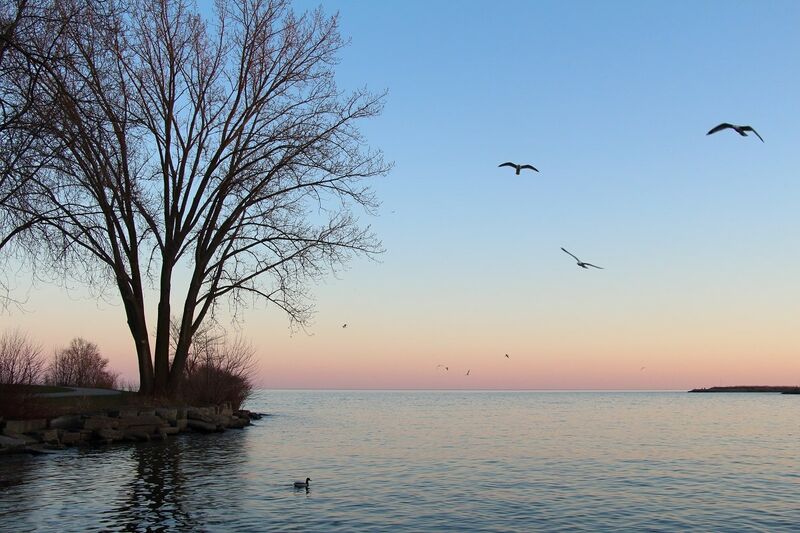 Lake Ontario is the smallest of the Great Lakes and the 14th largest lake in the world by surface area, which is about 7,340 square miles (19,000 square kilometers). Although it is smaller than Lake Erie, it is much deeper with a volume of 393 cubic miles (1,640 cubic kilometers). Unfortunately, Lake Ontario is the most polluted of the Great Lakes because the other four lakes flow into it, giving Lake Ontario all of their pollution. Lake Ontario also receives a lot of runoff from nearby farms and businesses. Unlike the other Great Lakes, Lake Ontario rarely freezes over because of its depth and the warm weather that comes from the southwest. Source: Wikimedia Commons via Lake Erie Coastal Ohio, Inc.
Lake Erie is significantly smaller than the three largest Great Lakes and the smallest Great Lake by volume. The surface area of Lake Erie is about 9,910 square miles (25,667 square kilometers) and the smallest Great Lake has a volume of 116 cubic miles (480 cubic kilometers). Since Lake Erie is the southernmost Great Lake, it is the warmest. However, more of Lake Erie’s surface freezes over during the winter because of how shallow it is compared to the other Great Lakes. 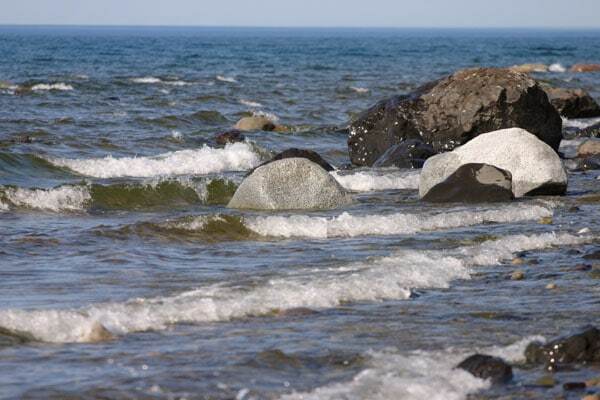 Lake Erie’s shoreline is major source of various minerals. The largest sandstone quarry in the world is located on Lake Erie’s shore in Amherst, Lorain County, Ohio. Lake Michigan is the only Great Lake that is located entirely in the United States (parts of the other four Great Lakes are in Canada). While Lake Michigan is the third largest Great Lake by surface area, it is the second largest lake by volume. Lake Michigan covers an area of about 22,404 square miles (58,030 square kilometers) and has a volume of 1,180 cubic miles (4,900 cubic kilometers). Four states – Wisconsin, Illinois, Indiana, and Michigan – border Lake Michigan. Some of the lake’s major port cities include Chicago, Illinois; Milwaukee, Wisconsin; Green Bay, Wisconsin; and Gary, Indiana. Lake Huron is the second largest of the Great Lakes by surface area, but has the longest shoreline of all the Great Lakes. 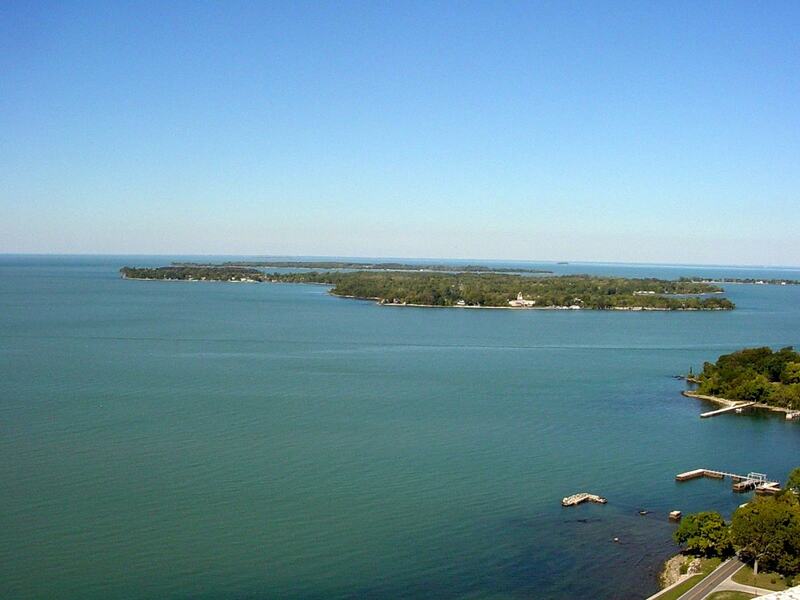 Lake Huron is also the fifth largest freshwater lake in the world. Michigan borders Lake Huron to the east and Ontario, Canada borders the lake to the north. Lake Huron has a surface area of about 23,007 square miles (59,588 square kilometers) and its shoreline is 3,827 miles (6,157 km) long. Lake Huron was the first of the Great Lakes to be explored by Europeans. 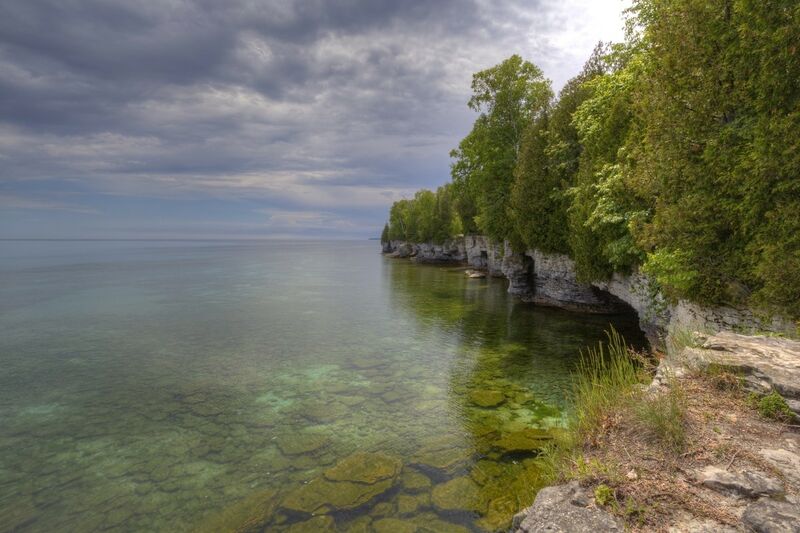 French explorers initially called Lake Huron La Mer Douce, the sweet sea. Lake Huron is so deep that there are more than 1,000 known shipwrecks located at the bottom of the lake. 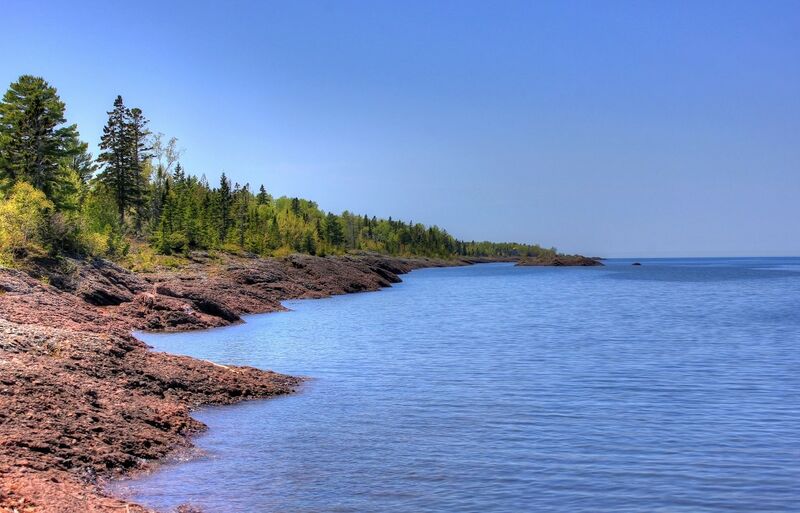 Lake Superior is not only the largest lake in the United States, it is also the largest freshwater lake in the world by surface area. The greatest of the Great Lakes has a surface area of 31,700 square miles (82,100 square kilometers) and a volume of 2,900 cubic miles (12,000 cubic kilometers). The United States – eastern edge of Minnesota, northern edge of Wisconsin, and the Upper Peninsula of Michigan – shares Lake Superior with parts of Ontario, Canada. 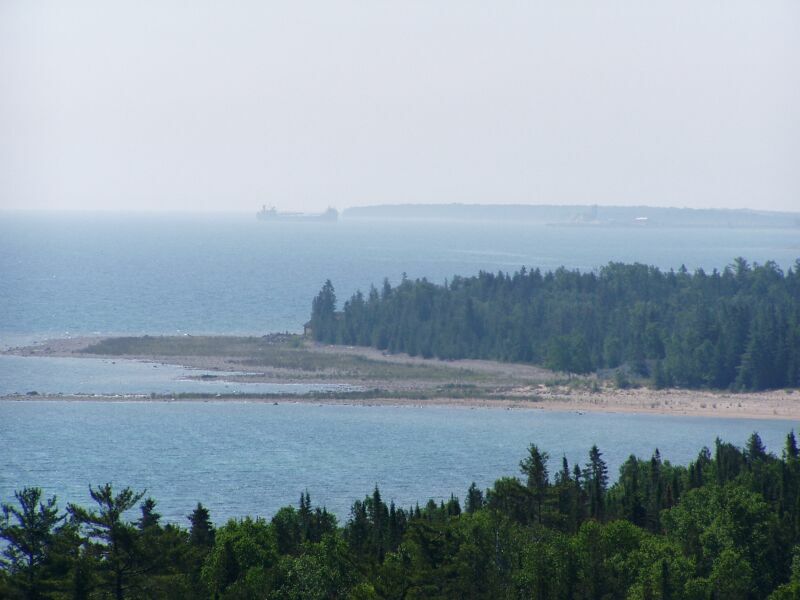 There are a number of National Parks inside and near Lake Superior, including Pictured Rocks National Lakeshore, Keweenaw National Historical Park, Isle Royale National Park, and the Apostle Islands National Lakeshore. Lake Superior is so large, that it would take 191 years for all of the water in Lake Superior to be replaced with new water.